To create a new tax, simply click on the Create Tax Rate button at the top of the page, then enter in the name and percentage. Shopventory allows for up to five numbers after the decimal. Then select the locations to which the rate applies. 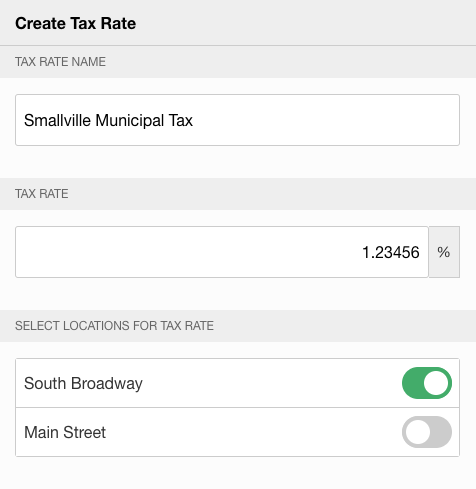 Enabling a tax rate will make that tax rate available at the selected locations. You can always edit a tax rate by clicking on the name in the Tax Rates tab. VAT (sometimes called GST) enables tax rates to be calculated as part of the prices of your Products. In other words, the prices of your Products will include taxes when VAT is selected. (This option is rarely used in the US). Taxes are enabled by default when creating an Product. Your point of sale provider has the final say when reporting taxes collected during sales. Tax totals on the Sales Report are reported by the point of sale provider on a sale-by-sale basis. The Sales Report shows what was actually collected.